This past weekend I paid a visit to Columbus’ newest brewery, Zaftig. I’ve read a few things about Zaftig online but I’d not yet had a chance to try any of their beer. Their taproom is located in an industrial space (545 Schrock Road, Worthington, OH 43085) that is practically in the shadow of the massive AB InBev Budweiser plant down the road (the two breweries are only 0.6 miles apart). I had a great time at a small brewery in a similar sort of industrial space when I visited Hess Brewing during my San Diego Beercation. That experience made me keen to visit some of the smaller, newer breweries in my back yard. I decided to start with Zaftig and recruited three friends (Chris, Mark and Hans) to venture out on a beautiful Saturday afternoon in mid-April to sample their wares. First let’s get some of the facts out of the way (all of which can be found in previous online articles and blogs). Zaftig is the creation of three partners, Jim Gokenbach, Brent Halsey, and a man of mystery who remains nameless in all of the online articles about the brewery. (Editors Note: The man of mystery was present during our visit and did not show any outward signs of being trained in the arts of espionage. He looked and acted like someone who could work in an IT department at a university, but then again if he really is a double agent that would be the perfect cover.) According to the dictionary Zaftig is an adjective used to describe a woman who (1) has a full rounded figure; (2) is pleasingly plump. Here the name is meant to represent the full bodied character of their beers. Although they have been working on getting the company off the ground since last summer they have only been officially open for business since February 1, 2014. They made their debut at the Grandview High Gravity Hullabaloo Beer Festival in February. Shadowed Mistress (8.0% abv): According to Jim this beer doesn’t fit neatly into a style category, perhaps most appropriately being described as a strong ale. Its creation was something of a happy accident. They were intending to brew a big IPA and when the malt shipment arrived it contained darker malts than they had ordered. In the spirit of innovation they forged ahead with the beer anyway. Even though it has enough hops to top 100 IBUs, they don’t jump out of you because the big malt backbone hides them well. Heavy Hearted Amber (8.0% abv): Normally I think of Amber Ales as an entry point for non-craft beer drinkers to step outside of their normal comfort zone, but this is not your little sister’s amber ale. The malts bring notes of toffee and caramel while the hops add some bite and keep things from getting too sweet, making for a very drinkable beer, perhaps dangerously so for the 8.0% abv. Think of it as an amped up English-style pale ale. I had a full pint of this one and it left me wanting more. Black Perle Stout (8.5% abv): Roasted malts bring the expected aromas and flavors of coffee and chocolate. It has a surprisingly hop-forward start, with a creamy, roasted malt finish that leaves some lingering burnt notes. This beer is what you would expect for an American Stout. The name comes from the use of Perle hops, a German hop known for its minty, spicy aroma. Both Mark and Hans opted for a pint of this beer. Wee Heavy (10.5% abv): This beer has a deep golden brown color, with a yeasty German nose that adds banana notes that would not be out of place in a Dunkelweizen or Hefeweizen. The taste is bursting with rich caramel and toffee flavors that are complimented by fleeting highlights of cinnamon and clove. All of this from hops, malts, yeast and water (no added spices). It has a thick, chewy mouthfeel and the alcohol is well hidden. It’s a complex, rich, decadent beer that is all about the malts. Hearkening back to my visit to San Diego this beer would not be out of place at the Alesmith Brewery (which is high praise). I had a full pint of this one as well, and Chris had two. Now that we’ve covered the important part (the beer), let’s move onto the taproom itself. The furnishing, such as there is, consists of a couple of couches, a flat screen TV, and a table with some chairs. It’s very casual as expected for a nanobrewery taproom. Although we were initially the only patrons, after about 20 minutes a few other people started arriving. My friends Mark and Hans who had decided bike up from Clintonville, arrived about 4:15 pm. As we got closer to 5 pm the crowd had grown to a dozen or more. The one thing that I really liked about the garage breweries I visited in San Diego was the friendly atmosphere that is more akin to a backyard party than a bar. That was also the case at Zaftig, and that quality alone is reason enough for me to visit again. It would be great if they could extend the hours a little later on Saturdays as we move into the summer. I’m not sure how many people are going to be in the mood for a 10.5% Wee Heavy at noon in July. The nozzles on one of the custom designed burners at Zaftig. Aside from the strength of their beers the other thing that strikes you about Zaftig is how small an operation it is. All three owners/brewers have day jobs and thus all of the brewing takes place on Saturdays. This limits the production to about 20 gallons per week. It’s a bit strange to think that if you buy a growler you will be going home with 2.5% of the weekly production. They have three custom designed burners, brew kettles that are on the large size for a homebrewer, but awfully small compared to what you would see at a typical brewpub. There is a temperature controlled room for culturing yeast and fermenting the beer, and a walk-in cooler for storing kegs and cold crashing the beer. Our visit coincided with the first day taps were installed directly into the walk-in cooler. Jim told us that they have plans to get a bigger brewing system and expand into the space on the opposite side of the back wall. Chris inside the fermentation room. When we were sampling the Black Perle Stout, Jim had told us that they were working on a bourbon barrel aged version. He explained that given the small quantities of beer being produced they can’t use a 55 gallon barrel and thus have to do the aging in a 1 gallon barrel. At the time it didn’t register in my head just how small a 1 gallon barrel is, but on our walkthrough of the cooler I saw the barrel. 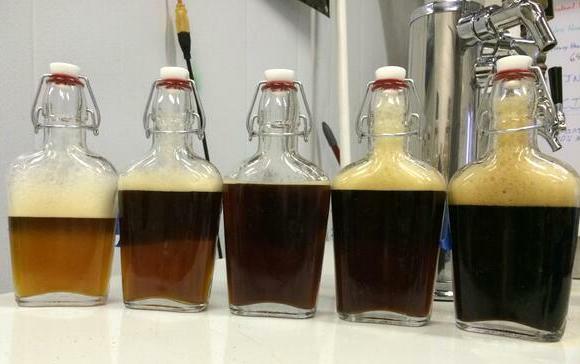 The image below of the barrel aging project really captures the fact this brewery is still in its infancy. If you think bottles of KBS are hard to come by, wait until this is released. It was cool to see a brewery like this in its infancy. I thought a couple of the beers were definitely worth seeking out, which bodes well for their future prospects. I certainly wish them well. I’m a big fan of the informal industrial style taproom vibe and I hope to make some return trips over the coming months. If you get a chance to try a Zaftig beer don’t pass up the chance. They keep a list of the places where you can buy their beer on their website. For those of you who are Clintonville residents, Jim told us that they will soon be in both the Crest Tavern and Bob’s Bar. At the scale they are currently producing I would expect their supply at any location to be intermittent. Hopefully as people in Columbus discover how good some of these beers are they will be able to expand and their product will be easier to track down. In the meantime if you want to try a Zaftig beer my advice is to make the trip up to Schrock Road and visit them at the source. 2.5% of their weekly production for a growler, not 5% as growlers are half gallons. Joe, you’re absolutely right. I’ll make the correction. Thanks for spotting this. The good news is that the Zaftig beer goes twice as far as the original post implied.